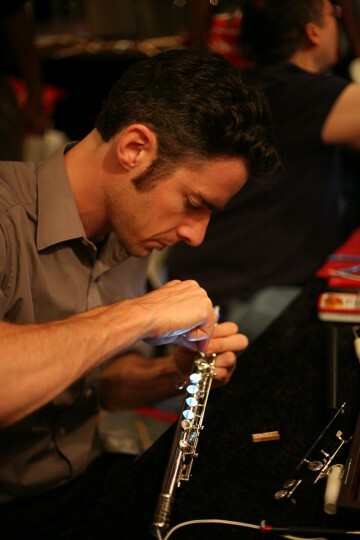 Here at Muramatsu America, we offer expert repair technicians trained by Master Technicians from the Muramatsu factory in Tokyo, Japan so you never have to worry about maintaining your Muramatsu flute to its highest potential. We also host a yearly workshop at our headquarters in Michigan to train independent technicians from North and South America the specifics of servicing a Muramatsu flute. Please see this MAP for a list of independent Authorized Repair Technicians* who have completed Muramatsu training. Repair technicians are required to train at the factory in Japan or by Master Technicians from the factory in Tokyo at our yearly training session in order to be authorized to receive authentic Muramatsu replacement parts. We recommend that customers inquire about the source of repair parts when having their instrument serviced. Please insist upon Muramatsu-authorized parts. We at Muramatsu America offer complete flute service for your Muramatsu flute, and use only genuine Muramatsu repair parts which are installed by our highly trained, Authorized Repair Technicians. Our service prices are reasonable and satisfaction for all repairs performed are guaranteed. We highly recommend that flutists who own Muramatsu flutes use our service department for all maintenance repairs as well as flute overhauls. In this way, your Muramatsu flute will receive the best service available, while maintaining the instrument’s full potential. Please note that we cannot accept responsibility for, or provide warranty on, any Muramatsu flute which has been subjected to “filing down” or altering of tone holes. We do not recommend this technique of flute padding for Muramatsu flutes. Every Muramatsu flute made for export to North America since 1995 has MA stamped on the ribbing. Look for this stamp as assurance that you are buying a flute with correct tuning and technical features, making it a flute imported to the specifications of Muramatsu America. This also gives you the peace of mind knowing that your instrument is fully warrantied and will qualify for service by our factory-trained Repair Technicians. We recommend using either UPS or Federal Express 2nd day air, as a quick and efficient way of shipping. We are in the office M-F noon-5p; please save yourself the additional expense and hassle and AVOID a request for delivery before noon. Please pack your flute carefully by wrapping each section in a small piece of tissue paper, then replacing each section in the case. Place the case in your case cover, and send your flute in a box that is a bit larger than the instrument (an 18x8x6 box works great!). Make sure there is packing material (bubble wrap, packing peanuts, newspaper, etc.) at the bottom of the box, then your flute, then more packing material on top. Please remember to include your name, address and phone number, along with a brief description of the work you would like to have done. Basic repairs such as a yearly clean, oil, and adjust are generally completed within seven to ten business days. This time frame includes return shipping of your flute. Our turnaround time for all repairs is one of the quickest in the industry. Call us if you have any questions at (248) 336 2323 or email us at flute@muramatsu-america.com. Please call our office to discuss your repair before sending your flute; we are happy to assist! Not sure what your flute needs? Ask for a check and advise. Our technicians will evaluate your flute, and our staff will call you with an estimate of the repairs they feel are necessary, along with the cost and length of time to complete the repair. Estimates are free and you are under no obligation to have the advised work performed. *Muramatsu America guarantees the satisfaction of work performed by Muramatsu America repair technicians at our headquarters in Michigan. Muramatsu America does not warranty or guarantee repair work performed by independent repair technicians regardless of completion of our training program.